I think one of the most challenging aspects of aviation related photography is photographing the people who maintain the aircraft. When I go on a photo shoot I try to concentrate on these unsung heroes, the guys and gals, the 18 and 19 year olds who make it all happen. This 119th FW maintainer was photographed at William Tell '94. I love to photograph Phantoms. They are both ugly and beautiful at the same time. 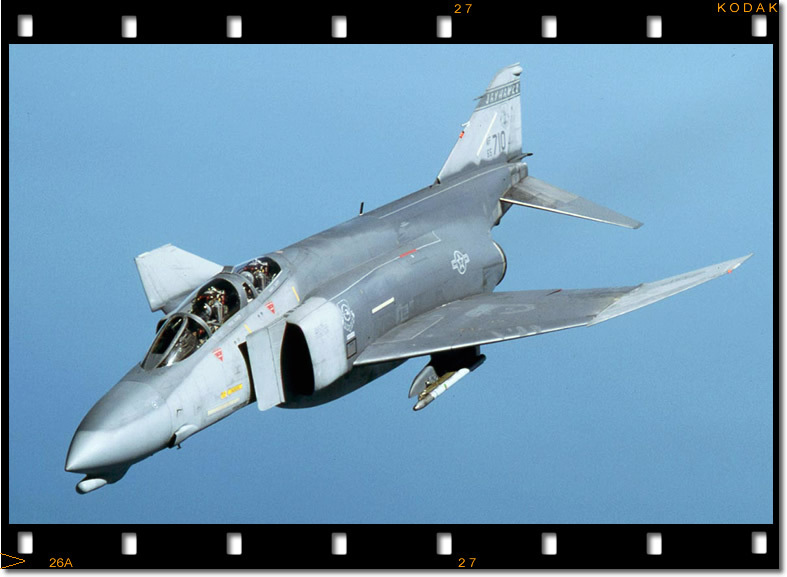 This example, a F-4D assigned to the 184th TFW, Kansas Air National Guard, was photographed from a KC-135E during Sentry Wolverine Flag 1987. We were flying at around 30,000 feet above Lake Huron when I asked the pilot to pose briefly for the camera. I was using a Canon A1, Canon 28 to 85mm lens and Kodachrome 64. 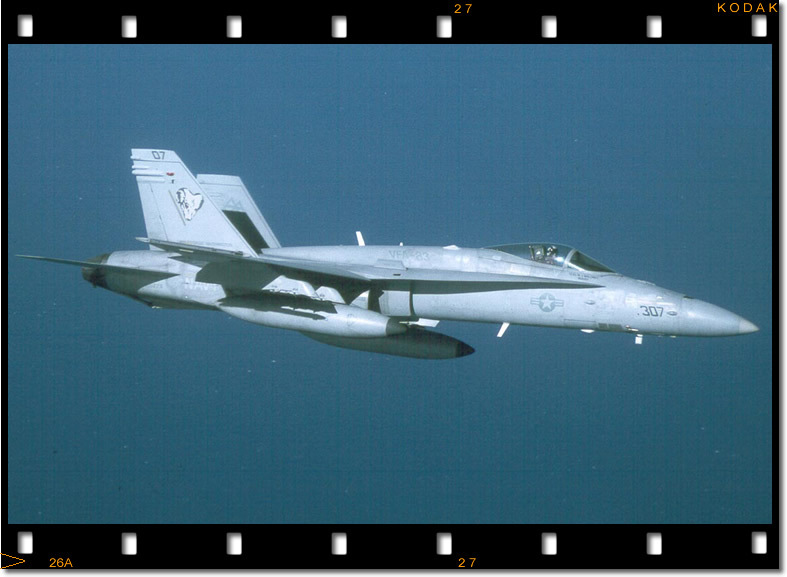 This F/A-18C and F-14B were photographed 28 March 2002 as the USS George Washington was working up for deployment. This image was caught on Kodachrome 64 film using a motor driven Canon A1 with a Tokina 80 to 200 lens. Shutter speed used was 250 at F.8. 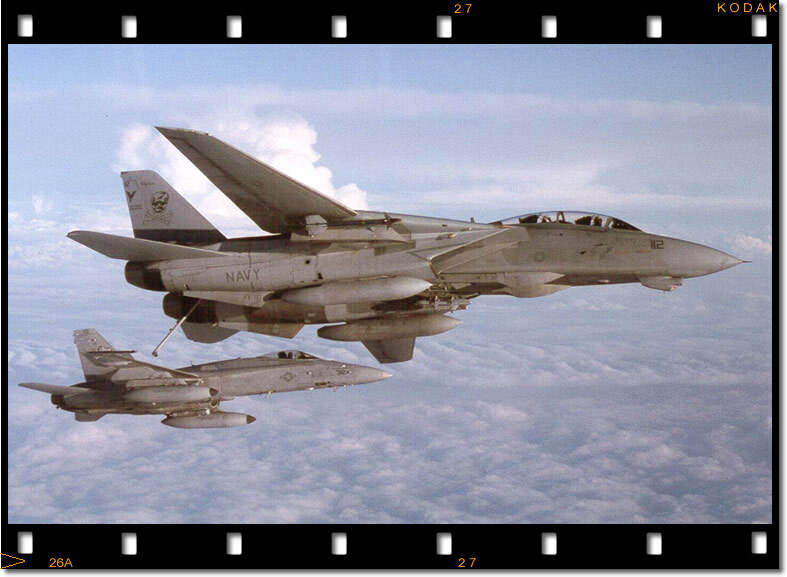 When I first saw this shot I could not help but think of the folly of replacing the F-14 with the F/A-18. The Lantirn equiped Tomcats are just now reaching the apex of their capabilities. They can fly further, faster and carry a greater bomb load than the F/A-18C,D,E or F. Retiring them now just does not make sense. 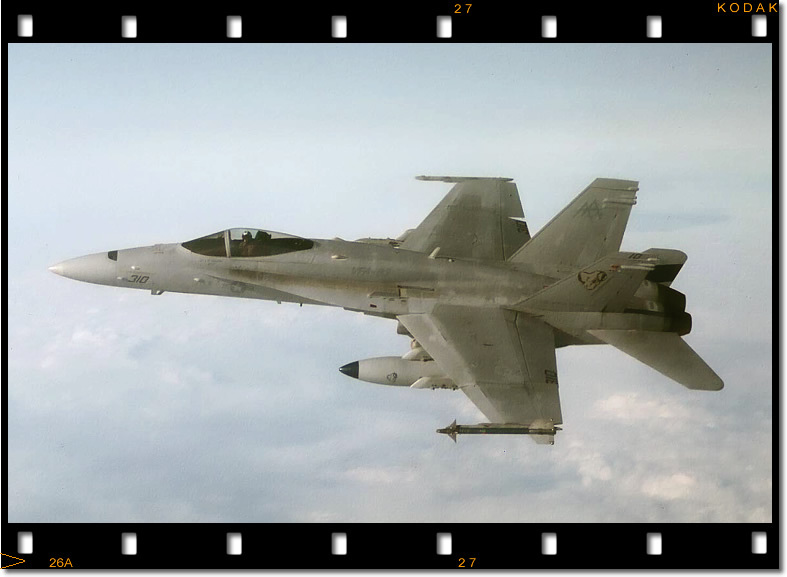 During April 1998, I was indeed fortunate to be one of the first photographers invited to fly with OPEC out of Biggs Army Air Field, El Paso, Texas. I spent the better part of a week with the unit flying morning, afternoon and evening sorties. I never thought flying in a helicopter could be so much fun and exciting. There's something to be said about skimming across the desert at 20 feet and 85 knots. This shot was taken from a Hip which was configured with no glass, the doors removed and two 55 gallon drums of garlic water to spray on the ground troops. 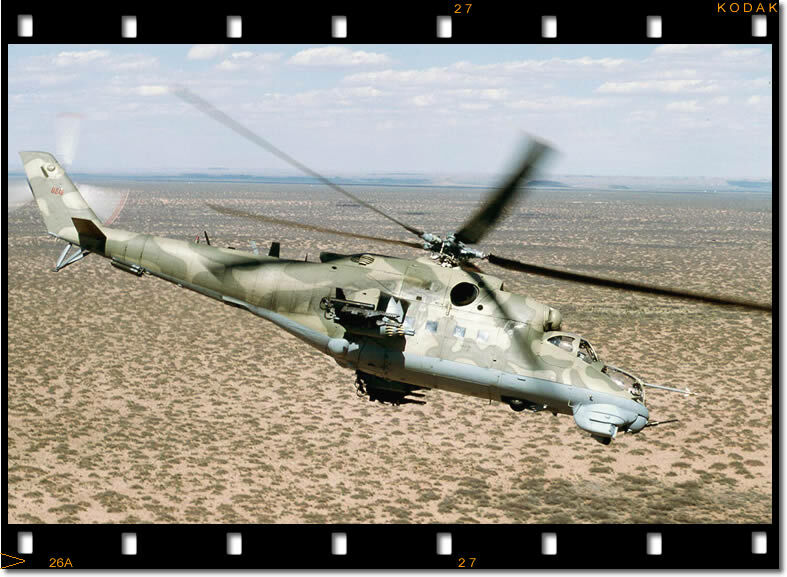 The subject is one of a half dozen or so Hind gunships owned and flown by the US Army. 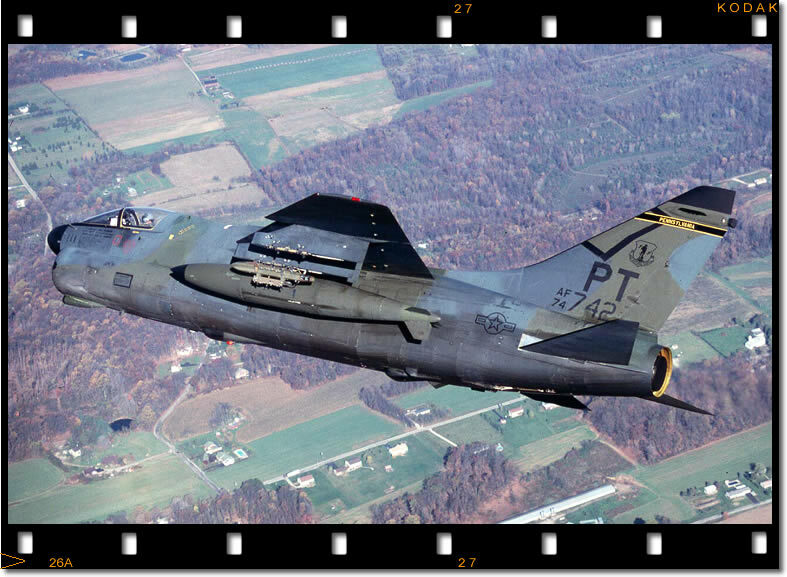 In November 1989 I was working on my A-7 SLUF book and had the privilege of having an orientation flight with the Pennsylvania Air National Guard. Our flight took us up north to Bradford Pennsylvania, then to the range at Fort Indiantown Gap. Following which the pilot was gracious enough to overfly my home. My wife was raking leaves in the backyard. When I got home I asked if she waved as we flew by. She replied, "Yes, but I wasn't using all my fingers." This shot was taken about a mile from the Brown homestead. 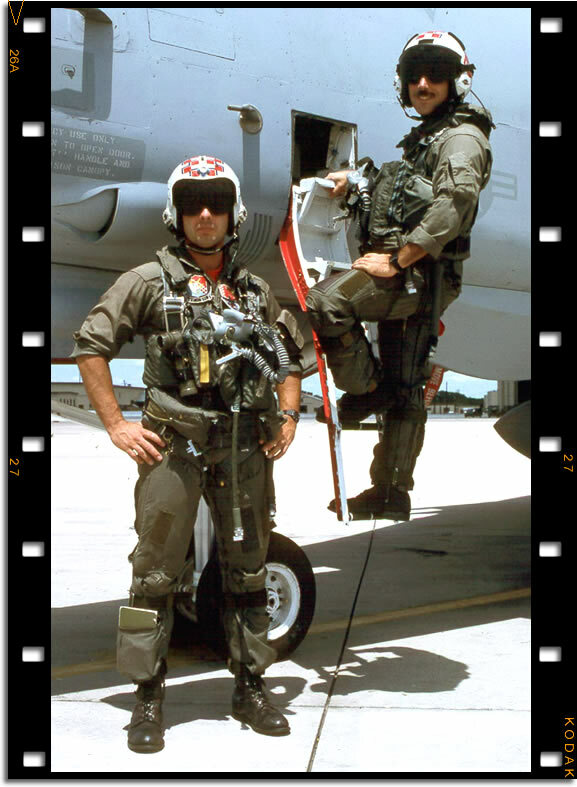 These F-14A crewmembers were photographed at RAM, the Reconnaissance Air Meet, Bergstrom AFB, Texas in 1988. This shot was published in a couple of aviation periodicals and has appeared on the cover of a Schiffer Book depicting Navy flight gear. I used Kodachrome 64, Canon A1 and Canon 28 to 85mm lens. 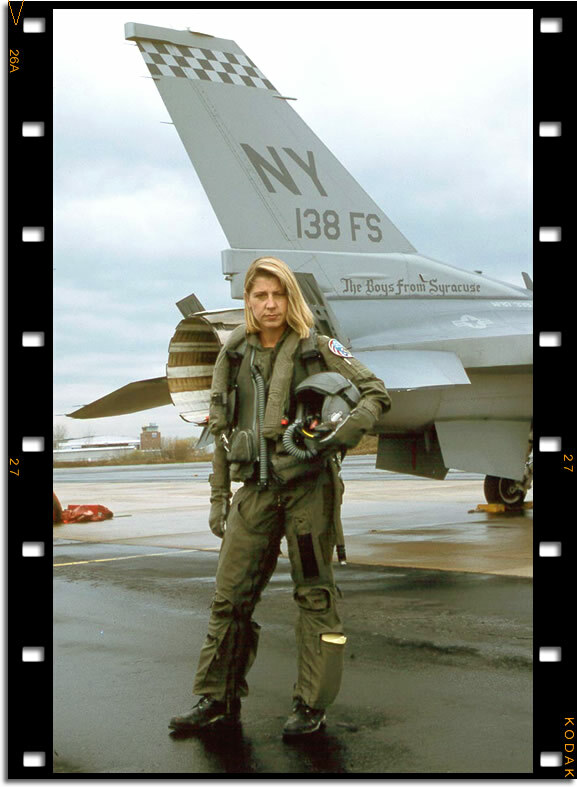 Major Jackie Parker was one of the first female fighter pilots assigned to an F-16 Viper squadron. I photographed her in November 1994. For once I was happy to see overcast conditions. I wanted to portray her as a fighter pilot, not a prom queen. I think the gray and damp conditions contributed to the overall affect. It was indeed a bad hair day. This image has received a lot of mileage in aviation periodicals and even the national news service. I took my daughter along on this photo shoot so she could see first hand that woman do fly fighter jets. For this shot I used my Canon A1, 55mm lens and Kodachrome 64. Shutter speed was down around 30th and/or 60th of a second. I bracketed the F stop using depth-of-field previewing to ensure the proper depth of field. David F. Brown was born in Philadelphia in 1951 and grew up in the nearby suburb of Levittown, Pennsylvania. Upon graduation from high school he attended Indiana University of Pennsylvania majoring in Police Administration and Sociology. David currently serves as a Police Sergeant and Shift Supervisor. He recently completed his 28th year in law enforcement and is looking forward to retirement in about 1400 days. He says he's not counting. David has been an avid aviation enthusiast since childhood. Although he considers Law Enforcement is profession, David considers flying his life. Since 1980, when his first magazine article was published in Air Classics, David has become a frequent contributor to a number of domestic and foreign aviation periodicals. In 1988, he was selected as the United States Correspondent for Air Forces Monthly, a postion he held for ten years. David has collaborated with well known aviation author Robert F. Dorr to produce pictorial books depicting the F-14 Tomcat and the F-16 Fighting Falcon. His first solo venture was Birds Of Prey, a pictorial depicting the aircraft, nose art and mission markings of OPERATIONS DESERT SHIELD/DESERT STORM. In 1997 he completed SLUF A-7 Corsair II, his fourth book, a pictorial depicting the venerable A-7 Corsair II. 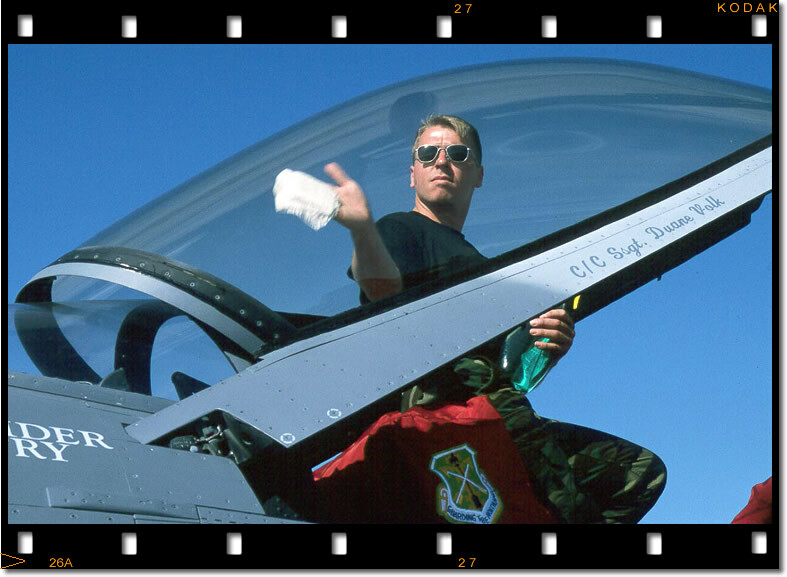 In 1998, David completed work on Tomcat Alley a photographic roll-call of the Grumman F-14 Tomcat. Since 1970, David has relied on Canon cameras and lens. He prefers Canon cameras because of their ruggedness and ability to shoot hundreds of rolls of film without a malfunction. David currently relies on three Canon A1s, four Canon and one Tokina lens.